Ben Mezrich’s laughable “true story” about the workings of Absolute Poker, Straight Flush, is back in the news this week courtesy of a Mezrich interview about the book done by Matt Parvis of PokerNews, the same guy who did the “Lederer Files” video interview last year. I tend to not view PokerNews’ interviews or general fluffed-news approach very highly, but since your faithful FlushDraw Contributing Editor is mentioned repeatedly in that interview by both Mezrich and Parvis, and that other poker-media outlets are expecting a response to the interview, I’ll oblige with a special Part 11 — a debunking of the latest Mezrich silliness. To fill in our newer readers on the backstory, I published a 10-part series on Mezrich’s latest book back in early June, beginning it just days after the book’s release. Ten parts might seem like overkill, but the intent was to clarify, point by point, how chock full of lies and how fraudulent a literary effort Straight Flush was. Whereas Mezrich’s book was a made-up fairy tale based on the image rehabilitation that Absolute Poker’s frat-boy founders wanted, the series here at FlushDraw was a factual evisceration, from the falsified timeline of events as presented by Mezrich to the glossing over the blatant illegalities undertaken by the AP crew, such as being one of the first online sites to offer blackjack to the US market. I wasn’t even aware of the PN interview’s publication this week until I was mentioned in connection with it on Twitter yesterday. Parvis and Mezrich agreed to the interview way back in late June, and it appears the interview was done back then and then sat on by Parvis and PN for a couple of months while they figured out what to do with it. I also admit I didn’t have a lot of faith in Parvis’s ability to press Mezrich on difficult questions, given Parvis’s considerable failure at that in the “Lederer Files” tapes, but to his credit he did a significantly better job of it this time around. If there’s a hole in Parvis’s interviewing game that he has yet to fix, is that he has yet to learn how to step back after a dodged question, then re-ask the subject a similar question in “yes” or “no” terms. As demonstrated ad nauseum with Lederer, Parvis tends to cede control and allow the interviewee to make speeches. Still, this effort was better. Where yours truly entered the mix was in some of the most blatant snow-jobbinging served up Mezrich in Straight Flush, particularly as detailed in parts five, six, and to a lesser extent part three, of the above. That’s the timeline-falsification stuff, first and foremost. [PN / Parvis] To me, the cash portion of that story is interesting, but the timeline which Haley Hintze wrote extensively about in a series of articles about your book is more interesting. In reality, the plane crash happened in early September and the cheating incident happens after the plane crash. In the book this series of events is reversed, which is a big change. [Mezrich] So I talked to the guys about this. They said the cheating was ongoing for about seven weeks and within that time period, the plane crash happened. So they are maintaining that within the period of the cheating scandal a plane crash happened. In the book, the chronology might be compressed in a way that it looks differently but it is all in the same time period. I don’t think I was dating the chapters. [PN] But, in the book the trip that Scott takes on the plane is his swan song after leaving the company because of the cheating incident. Then the plane crashes. In reality, the big event, the major tournament in which players were cheated was actually after the plane crash. September 12th, and it came out in October. [Mezrich] I don’t know when the discussions took place between Scott and the group about the cheating. So somewhere in there the plane crash happened. The timeline discussed, was how they told the story. They maintain they had this discussion with Scott and the crash happened when they were leaving the company. Whether or not the AP press releases came out after the crash or before, Scott & Hilt feel strongly they were leaving the company when they left with the plane. I don’t believe I dated these chapters specially because this whole period was uncertain. That’s how they told the story. My guess is that the cheating happened during this time period. They confronted Scott about the cheating and so Scott got on the plane to go. Then the press releases came out from AP saying they got rid of someone. My guess is their chronology is probably accurate. I feel like the only reason Haley Hintze has a problem with that is she feels there is an agenda placing a plane crash there. When there really wasn’t an agenda because there was no money on the plane. I feel very confident there was no money on the plane. [PN] Why do you feel so confident? [Mezrich] For one, there is no evidence. All there was were articles from the places like the Ti[c]o Times. It started with some blog claiming there was money on this plane. If you’ve read any of my books I really want there to be money on that plane because that’s a great scene. I wrote a book called Busting Vegas where there was money on a plane. First of all, the FAA took over the crash site, and so did the Costa Rican government. There were no reports of money. Where is this money now? Well, the Costa Rican government used the “money on the plane” theory to search Scott Tom’s house. We’ll get to the plane crash in greater detail in a moment, but Mezrich’s willingness to falsify the order of events is crystal clear. Mezrich also accuses me of having an agenda, and he’s right — I want to get the truth out there, and a mass-market piece of crap such as his book does nothing but bury that truth, which is what the AP frat boys want. One sideline insinuation served up by others remains unanswered by Mezrich: A yes-or-no declaration as to whether he was commissioned in any form by Scott Tom or any other AP founder or owner to write that book. But the plane crash is oh so curious, whether or not there was money on that private jet. It occurred on September 12, 2007, and Scott Tom and Hilt Tatum and their wives/girlfriends hopped another plane the next day and resumed their week-long jaunt in the Caribbean; they only waited 24 hours because Scott’s girlfriend was pregnant and officials wanted to keep her overnight for observation. The series of screen grabs I published on my own poker blog a couple of years later showed what happened next: A rush of high-stakes cheating done from different locations throughout the Caribbean, mirroring Scott Tom’s known movements, and using several different accounts linked to Scott Tom personal — GRAYCAT, DOUBLEDRAG and others. Then, once Scott returned to Costa Rica, the infamous POTRIPPER tourney occurred. It wasn’t done from his office, as Mezrich insinuated as a possibility; it was done from Scott Tom’s home, though that was quite the set-up, with the ability to run a couple dozen computers at once. Lots of people know who sent me those screen grabs, and they were available to others within the poker world before I published. No one who knows where they came from has ever doubted that they are genuine, and the weird details within some of the accounts are so bizarre that no outsider could have faked them, such as renaming the not-real owner of one Scott Tom-controlled account as “Jaeson,” almost certainly in honor of a bartender named Jaeson back in AP’s Seattle-founding days who could be found as a friend on Tom’s then-public Facebook page. No outsider would know enough to make up a detail such as that. I saw a screenshot (of some of the evidence) but what am I really looking at there? Show me where that came from, give me the affidavits for the people who posted that. If you were able to give me all of that then I would have something to go on. As a blogger it seems you can write whatever you want, but as a journalist writing a book you can’t. So newspapers and media outlets and authors and reporters aren’t allowed to research stories on their own, Mr. Mezrich? And where are your affidavits, sir, for what you claim to be a true story? Mezrich claims he looked at “a screen grab,” though I published dozens, and his method of dealing with the facts presented therein was just to utterly ignore them all. And just to clarify, I’ve never heard anyone else call Mezrich a journalist, as he claims he is. He doesn’t deserve that title. Let’s move on to agendas. 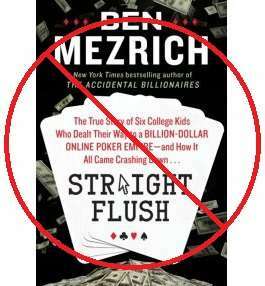 Near the end of the PN interview, Mezrich calls Straight Flush his “best-sourced book.” Once I regained consciousness, having passed out from uncontrollable laughter, I decided to examine that claim. Whether or not there was money on that plane is not a topic that either Mezrich or I can prove or disprove years after the fact, from the comfort of our seats. However, Mezrich’s claim that the money on the plane was a rumor from a single blog is a significant distortion. That rumor started there, on a well-connected, prominent sportsbetting blog, but it was long forgotten when the confirmation appeared nearly three years later, in not one, but several, news reports from Costa Rica and one from Panama as well, citing a senior official from the OIJ, Costa Rica’s version of the FBI. Mezrich dismisses that in a vaguely racist way, dissing the news reports as third-world nonsense while denigrating the title of one of Costa Rica’s English-language outlets, the Tico Times. Maybe if Mezrich understood the culture a little better, he’d understand why the money-on-the-plane story is highly plausible. And if he actually got the whole story about AP from the frat boys he interviewed, instead of just the filtered fantasies, he’d kick it up to highly likely. There are two strong possibilities for why Scott Tom and Hilt Tatum would have money on that jet, actually three… if you consider that it may have been just a little bit of money-laundering. Yet the cheating evidenced by the POTRIPPER tourney was frantic, blatant and nonsensical, and it spoke of a need for immediate cash. Oh, wait, that plane crash just a couple of days before, where it was rumored dufflebags full of cash were seized? Nonsense, sez Ben, just because an honest type like Scott Tom told him so. Here’s a news flash for Mezrich: Cheating and lying is often a pathological bevahior; Scott Tom’s claim that he had no motive to steal because he already had money is rubbish. Now, here’s a couple of little scoops that Ben never got to. When I first heard about the crash and realized that the crashed plane’s first scheduled stop was Cartegena, Columbia, I had to wonder if major drug purchases were involved. However, that scenario didn’t hold water. Not only did it fail to explain the frantic urgency of the cheating, it puts Scott and Hilt at unnecessary personal risk, since by all insider accounts the frat boys — whoever among them was using — could get drugs in Costa Rica with ease. Cartegena was also almost exactly halfway from Costa Rica to Antigua. It was a planned refueling stop, nothing more. But there was something else going on in the Caribbean, two something elses, in fact. First, in 2007 AP essentially took over the operations of the UltimateBet Aruba Classic, and company insiders have reported that that tourney required hundreds of thousands of dollars in bribes to be allowed to operate smoothly. It took the AP boys by surprise; they didn’t realize how much Russ Hamilton spent on that. And it also would have taken cash, lots of it, and Russ used to move money down there all the time for this and other purposes. Then there was the secret land-based casino project undertaken by Scott Tom and the other AP insiders. The project had a name, and I’ve got that buried somewhere in my e-mails, and it was supposed to be in Antigua. As with the Aruba tourney, it allegedly required plenty of grease to even get to the point of being considered by Antiguan officials, and it eventually fell apart along with the rest of AP. But apart from the tens of millions siphoned off from AP by the frat boys and moved into Caribbean real estate, it’s another likely answer for where a lot of the real stolen money went. It is not at all surprising that Ben Mezrich was clueless as to the existence of this casino plan. So money on the plane remains a very viable possibility. Now, Mezrich claims that he would have loved for there to have been money on the plane, but that is a secret the AP boys would have dared not share, given the ongoing seizure efforts against AP by both American and Norwegian authorities, which were still in progress while Mezrich did his interviews. Why then, did Mezrich even include the plane story? And why did he falsify its telling so thoroughly so as to place it after the public discovery of the cheating? As clearly detailed by Parvis in his questioning, Mezrich insists that Scott Tom and Hilt Tatum got on that plane to depart the company, since all the blame for the cheating had been heaped on Tom, boo hoo hoo. It’s a ridiculous lie. The outing of Tom as the probable cheater wouldn’t occur for several more weeks, even though internally, all the AP execs knew that the accounts being accused of of cheating by the site’s players were Scott Tom’s own accounts. Those accounts were specially tagged in September, though the cheating wasn’t proven by outsiders until October. I don’t know when the discussions took place between Scott and the group about the cheating. So somewhere in there the plane crash happened. The timeline discussed, was how they told the story. They maintain they had this discussion with Scott and the crash happened when they were leaving the company. Whether or not the AP press releases came out after the crash or before, Scott & Hilt feel strongly they were leaving the company when they left with the plane. I don’t believe I dated these chapters specially because this whole period was uncertain. That’s how they told the story. My guess is that the cheating happened during this time period. They confronted Scott about the cheating and so Scott got on the plane to go. Then the press releases came out from AP saying they got rid of someone. My guess is their chronology is probably accurate. That’s an “I don’t know” and two “my guess”-es from a so-called “true story” writer, and if he claims that this whole period was uncertain as to timing, it means he either ignored or didn’t bother to research the facts of how the AP scandal was exposed. If that’s true, then this confirms that the AP execs knew that Scott Tom was the primary cheater for several weeks before public evidence of Scott Tom’s involvement emerged five weeks later, all while the site denied that there was any cheating going on and then blamed it on a low-level employee. However, since that Pete Barovich anecdote about the AP cover-up is in the book and precedes the plane-crash saga, Mezrich’s timeline is garbage anyway. And at last we return to agendas — who has them, and who doesn’t. There is only one plausible explanation for Ben Mezrich to include and falsify the timing of the plane-crash story and to ignore all the other evidence of Scott Tom’s involvement. Mezrich must propagate this sham in order to portray Scott Tom as a sympathetic antihero. If he cannot upsell Scott Tom, Ben Mezrich cannot sell movie rights, nor milk his own personal fame. Mezrich has millions of reasons to want to not believe that Scott Tom isn’t the crook that all the evidence says Scott Tom really is. It’s Mezrich with the truth-hiding agenda, and no one else. And that’s why this PN interview is crud, just another lame attempt at spin by a literary fraud who’s fled serious questioning on poker forums and has blocked at least a dozen people who have challenged his lies on Twitter. For a true-story writer, Ben Mezrich shows a remarkable disdain for answering the tough questions truthfully, honestly and directly. Straight Flush remains a fraud of a book, and another mealy disclaimer by its author changes nothing. That’s a polite way of saying Mezrich’s claims make no sense. Now ask yourself why that might be.